I’m a real stickler for not trying something new. I know that’s not always a good thing. 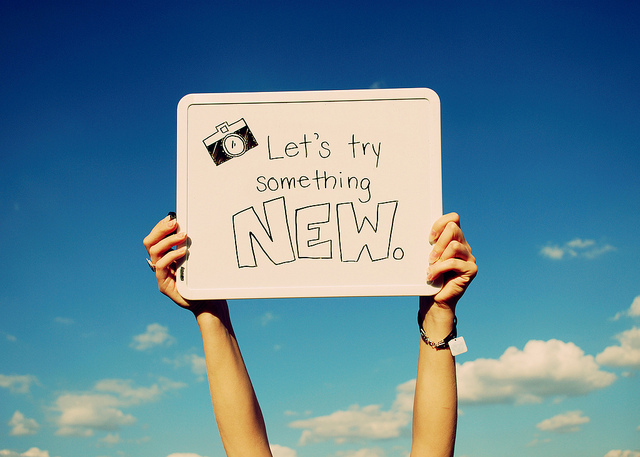 I had a conversation with a friend the other night and I was explaining it to her this way: if something works the way I’ve always known it, then why try something new when that could go wrong? For instance, if I always love the Reese’s Cup milkshake at Cook Out, then why try something else? Something else might be good, but it might not be. That basically boils down to the fact that I sometimes really hate taking risks. I like comfort way too much. But there are some things where we need to stick to what we know is true and not try something new. So often in college I’ve seen people reject the way they lived at home and take on a whole new way of life. People who had some semblance of faith coming into college lose it by trying something new, like the party scene or investing themselves in something else. I am astonished that you are so quickly deserting him who called you in the grace of Christ and are returning to a different gospel – not that there is another one, but there are some who trouble you and want to distort the gospel of Christ. One of the main themes of Galatians is justification by faith alone and not by works. This is the central message of the Christian gospel, and that’s why it’s striking Paul so greatly that his audience is abandoning it, wanting to add works to that justification. But, as v. 6 says, they are “quickly deserting him who called you in the grace of Christ,” God. Any abandonment of the gospel of God is ultimately an abandonment of God. That’s how serious Paul takes the truth of the gospel. He states that there are “different” gospels being preached, ones that “distort the gospel of Christ.” Ultimately, preaching anything that does not reflect the true gospel is a distortion. However, Paul boldly claims that those aren’t even a real gospel. He says, “Not that there is another one” (v. 7). People are preaching a different one, but it’s not even the real gospel, so Paul doesn’t even want to give it the title of “good news.” There is no good news other than the good news of the Christ-dying, sin debt-paying, eternal life-giving gospel that’s worth giving your life to. Paul says that, in the case of the Galatians, deserting God results in turning to a different gospel (v. 6). I think it also works the other way around: when you desert the true gospel, you desert the true God. For what is accepting the true gospel if not running towards God in recognition of your need of a Savior? By abandoning the true gospel, you abandon God. It’s so crucial that we recognize that because it displays God’s connectedness to the true gospel and the imperative we have to stay true to it. God is intricately the initiator of the true gospel. He calls sinners to Himself, made possible by the atoning death of Jesus Christ. He calls us “in the grace of Christ.” We would not be saved it not for God’s calling. We must stay true to it. Our reliance on the true gospel is an indication of our trust in God and His Word. If we trust God and His Word, we’ll stay true to the gospel we are taught by Scripture. Those who are preaching “different” gospels are “distort(ing) the gospel of Christ” (v. 7). Ultimately, anything claiming to be “good news” is going to promise similar things. But here, the ones teaching falsely were distorting. The Greek for distort in this verse – “metastrophō” – is literally translated “to pervert.” The pervert something is to change the purpose, meaning or intent of something, usually for bad purposes. The false teachers were teaching a twisted version of the truth. In his commentary on the verse, John MacArthur writes, “By adding law to the gospel of Christ, the false teachers were effectively destroying grace, turning the message of God’s undeserved favor toward sinners into a message of earned and merited favor.” This is a perverted version of the truth. God is still a part of this “gospel,” but it’s a horrible interpretation. Just like any teaching that doesn’t reflect the true gospel that’s spelled out in Scripture, this is a corruption of truth and should not be trusted. Yet sometimes I believe it and trust it, that I need to do a bunch of good works to get on God’s good side. Praise Him for His grace in those times. Have you believed in the real gospel? Have you trusted the real God? Following any other way that promises life and joy will ultimately let you down. Only by following Jesus can you find true life. This entry was posted in The Bible and tagged Christianity, false gospel, Galatians 1, Paul, The Bible, true gospel by Zachary Horner. Bookmark the permalink.